SOME PIG PRODUCERS get the wrong end of the stick when they come to market their pigs. Marketing, by definition, is discovering what the consumer wants and setting out to satisfy the consumer’s demands, aided by the most efficient sales and distribution system. But some farmers do not think of what the consumer requires. Instead they develop a certain type of pig and then look for a slaughterer who will buy. 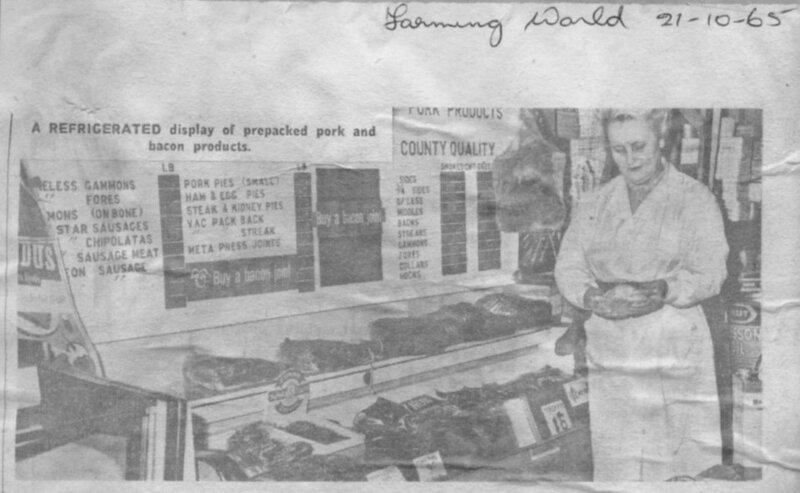 This misconception can produce tragic results, with the expensive production of pig meat that the housewife is not interested in buying, Currently the general trade in bacon and pork is based upon the complete Wiltshire side in bacon, a together with heavy hog joints and cuts and a varying range of pork pigs, but let’s look at what the housewife wants. There is a strong and continuing swing towards “convenience” foods, mainly in prepacked form. She wants to have pork and bacon products trimmed, de-fatted and de-boned, ready to put straight in the oven. Her prime requirement is a product that is immediately ready to be cooked, and the bacon joint has been an important development in this field. It is boneless and fully prepared at the factory for the housewife. Soon bacon steaks and every part of the bacon pig will be sold pre-packed and fully prepared for cooking. Looking at the pie trade we can see that this has gone through the same revolution. Pork pies and steak-and-kidney pies require no preparation. Estimates of the value of the pie trade vary between £34 million and £55 million per annum and there has been still too little research on consumer preference. Yet there is no denying the enormous increase in popularity that these “convenience” foods are enjoying. Naturally, too, the housewife wants quality, attractive presentation and a price that she is prepared to pay. There is a definite market for quality bacon to compete with Danish as against the cheaper cuts from heavy hogs and for which the producer can expect to be paid a premium The housewife is prepared to pay extra for better quality, providing it really represents genuine value for money. Some prepack bacons are sold at 7½ oz. weight so that it seems at first sight more competitively priced, if you look only at the price. But the housewife is realising that it is only price in relation to weight that offers real value and, in the biscuit field for example, there has recently been a pronounced swing back to the full 8 oz. packs. A look at recent trends in sausages and chipolatas shows the extent to which the housewife is prepared to pay for higher quality. Two years ago, 1 lb. of chipolatas were sold for every 6 lb. of sausages. Today 1 lb. of chipolatas is sold for every 2 lb. of sausages. Probably the main reason for this is that chipolatas have a more tender taste because sheep casings are used, whereas hog casings are used for sausages. But the higher price of 7d./8d. a lb. shows clearly the degree to which quality influences her buying habits. The housewife’s demand for convenience and quality merits ever greater attention from the food manufacturer because her needs coincide with the requirements of the shopkeeper and the supermarket. They both want goods that are easy to handle, simple to display and that will appeal to the housewife. Here again prepack goods are gaining in popularity. If the skilled butchery of pork chops can be carried out in the factory, where, for example, there are machine cutters that will handle 140 chops a minute, this saves the shopkeeper the trouble of preparing it himself and helps to overcome the present shortage of staff skilled in this sort of work. Prepack joints, chops, and cooked meats, sausages, pies and prepack bacon are, therefore, what the housewife and the trade expect from the pig producer. And it is our marketing job to see that they get what they want. But what has all this to do with the pig farmer? A great deal. The farmer is the prime producer and the type of pig he produces can be more or less profitable depending on the pig processor’s ability to sell his own products profitably. The profit of the factory is particularly important to the farmer in the case of co-operatives, for he stands to gain from the factory’s financial success. In our case we require a pig that enables us to serve the housewife and the shopkeeper with the goods they want in the most efficient manner. In the case of a pork pig this is the 120-140 lb. cutter. The cutter is the most efficient pig for our pork requirements—and we are prepared to pay a high price for it for this reason. The cutter is an all-round pig and we can utilise it for the greatest profit, depending on the market. It can be cut into chops or other joints, or used for manufacture in sausages, pies, and other cooked and manufactured foods. If the fresh meat market is offering low prices, we can use the cutters in a manufactured way that will bring a higher return. In fact the cutter pig enables us to hedge against the market dropping because we can use it in a number of different ways, and the more economically efficient the pig processor can be, the more security the pig producer has. A fully farmer-owned co-operative gives the pig producer a guarantee against vertical integration. However it can only function properly by fulfilling the market demands for convenience foods, offering good quality at a competitive price, and to do this must rely on the marketing sense of the pig farmer to produce the specialised pigs required.